Labor Day in Pigeon Forge is just around the corner and we couldn't be more excited for this end of summer holiday! Traditionally, Labor Day is observed on the First Monday in September to honor the accomplishments of American workers. And there's no better way to celebrate than enjoying a relaxing getaway for your three-day weekend! To help you get the most out of your trip, we've made this guide for visiting Pigeon Forge for Labor Day with events, things to do, and insider tips. Check out these great ideas for enjoying your Smoky Mountain Labor Day Weekend! Check out these fun events and activities that are perfect for your Labor Day trip to the beautiful mountains of Tennessee! Labor Day Sales at Tanger Outlets - Many shops at Tanger Outlets in Sevierville will have extended hours from 9 AM to 9 PM on Labor Day, so you have even more time to find terrific deals. Many shops have special blow-out end of summer sales, so this is prime opportunity to save big on your favorite brand clothing and accessories. Rent a Boat on Douglas Lake – Labor Day is a natural time to enjoy an outing at the lake. Douglas Lake is a beautiful destination that's only minutes away from Pigeon Forge where you can rent a pontoon, Jet Ski, stand up paddle board, or Kayak. Host A Cabin Cookout – Throw some burgers and hot dogs on the grill while you enjoy sitting out on your cabin's deck. After all, nothing beats grilling out after an excellent day of hiking the Smokies. Go Swimming – Though summer is almost over, the weather is still perfect for swimming. Come check out these beautiful places in the national park to go for a refreshing dip in a pristine mountain swimming hole! Additionally, Dollywood Splash Country Waterpark is open for Labor Day. Picnic in the National Park – Enjoy a fun picnic surrounded by the beauty of nature! Picnic areas in the national park like Metcalf Bottoms, Greenbrier, and Cosby have nice riverside picnic facilities that are ideal for a relaxing afternoon in the mountains. Go Rafting – Labor Day Weekend is a terrific time to enjoy whitewater rafting on the Little Pigeon River. Get your adrenaline pumping while you explore the beautiful waterways of the Smokies. Labor Day weekend is a fantastic time to visit the Smoky Mountains. The only problem is that everyone thinks so too! While it is true that Pigeon Forge and the Great Smoky Mountains National Park are busier on this weekend, there are ways to enjoy a peaceful vacation in the Smokies without dealing with the crowds! 1. Stay in Sevierville or Wears Valley – Labor Day draws big crowds to Pigeon Forge and Gatlinburg. 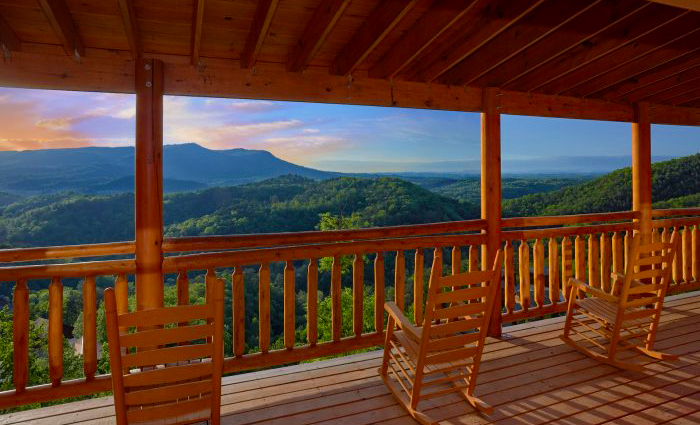 Luckily, you can always find some peace and quiet in the picturesque communities of Sevierville and Wears Valley. 2. Avoid Big Attractions – If you dislike large crowds, you may want to avoid popular attractions like The Island, The Old Mill, Dollywood, and Ripley's Aquarium of the Smokies. Instead, check out lesser visited attractions like The Alpine Mountain Coaster, The Forbidden Caverns, Foxfire Mountain, or Sweet Fanny Adams Theater. 3. Find Less-Visited Areas of the National Park – Beautiful sights in the Great Smoky Mountains National Park like Cades Cove, Laurel Falls Trail, Alum Cave Trail, and the Roaring Fork Motor Trail see lots of traffic on big holidays like Labor Day weekend. To get away from the crowds and enjoy some seclusion in nature, be sure to check out less-traveled parts of the national park like Cataloochee Valley, Greenbrier, Tremont, Metcalf Bottoms, and Cosby. Need more ideas for planning your Labor Day weekend? Feel free to contact our reservations office at (865) 429-4121. Our helpful reservations specialists will be glad to assist you in planning your end of summer trip to the Smokies! Book My Labor Day Cabin!